Sorry we missed you on Halloween, but we’ve still got a treat for you. 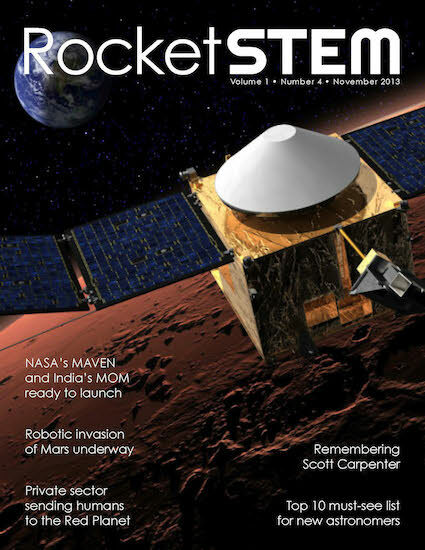 Yes, another issue of RocketSTEM, just one month removed from the last one. Call it feeling ambitious, or just plain insanity, but here it is. This issue shines the spotlight on Mars and humanity’s attempts to better understand the Red Planet. India prepares its first launch to investigate Mars. NASA readies MAVEN to explore the atmosphere of the Red Planet. An overview of the five spacecraft currently exploring Mars. The Mars Society has a goal of places humans on the Red Planet within a decade. Inspiration Mars is working to send astronauts on a slingshot around Mars. Mars One wants to colonize the Red Planet and broadcast it as reality television. A tribute to Scott Carpenter, one of the original Mercury Seven astronauts. Our Top 10 must-see list of celestial objects for backyard astronomers. And much more. Forty-eight pages of pure content. No advertising. Bullock and Clooney star in this spectacular space movie, but does the math add up? An ever increasing fleet of robots are leaving ‘no stone unturned’ on Mars. The Mangalyaan probe will mark India’s first attempt to reach the Red Planet. NASA prepares to lauch an obital spacecraft to study the Martian atmosphere. A tribute to Scott Carpenter, a member of the original Mercury Seven astronaut class. We’ve curated a list of the top 10 celestial views for beginning astronomers.